The Experiment (Experience 112 in Europe) is one of the most unique and immersive PC games ever made, in spite of clunky localization and an unforgivably cumbersome user interface. It's Night Trap finally done right, even if no one was asking. Also responsible for the creepy alternate reality games Evidence: The Last Ritual and Missing: Since January, developer Lexis Numerique displays its expertise at putting you in the game by disconnecting the player from direct involvement in the action. In The Experiment, what you'll do mostly is watch. 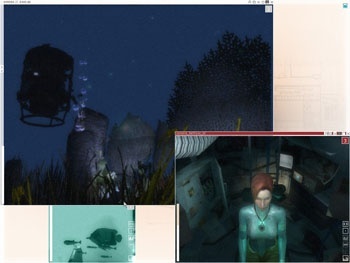 The game opens with you receiving the feed from a security camera, staring at a sleeping young woman, the surrounding room overgrown with plants and covered in rust. You watch as the she slowly awakens and stumbles about on numb, weak legs. She reads a letter on the nightstand, telling her of some unknown disaster she's apparently survived. Hearing a sound, she leaves the room to check the hallway, leaving you behind, powerless to even change your viewing angle. Eventually the girl, Lea, returns, and noticing the active camera, yells out the username for the network in the hope that you would take the hint and log on, activating the facility's security systems. Doing so elicits a visible sigh of relief from Lea, as there is indeed someone at the monitors. She asks you a yes-or-no question, which has you literally swinging your viewpoint from side to side to nod out your answer. I doesn't get much more "first-person" than this. Further progress has you guiding your new charge through the debris-strewn ship, activating cameras to keep her in view. Via the security interface you're also able to unlock doors, flash on lights to direct her attention, and most importantly, trawl through the ship's onboard records to decipher passwords, read the crew's email, and solve mysteries. Camera upgrades also allow you to drive a small robot to pick a keycard out of a gas-filled room, zoom in on a blackboard to read a keycode, and turn on night-vision to find a safe path through a dark room. You can view manage multiple viewing angles, setting up to 3 cameras in individual task windows. Your role in the game is paradoxical. On the one hand, you are reduced to a mute observer, removed from the scene and powerless to influence what Lea does, locked out of her mind. You're Gordon Freeman on rails, with neither gun nor legs. At the same time you're a guardian angel, with Lea almost completely dependent on your aid, her progress as fast or as slow as yours. It's the damsel in distress trope twisted inside out, with the prince just a ghostly fly on the wall. In The Experiment Lexis Numerique has added an extra dimension to its already dense mystery hunting. Where Evidence and Missing had you scouring the internet for clues and apocrypha, here you scour the details on your monitor and what you can see via the cameras. Find the right camera angle to properly view those numbers on a nearby blackboard. What information does the laboratory director hide behind his password-locked files? There are blessedly few of the pixel-hunting "rubber duck + pipe" item puzzles common in other adventure games, but I recommend you keep a notepad and pen handy.